Everyone knows that the DUO 60 is the most popular Instant Pot model in the world these days, but there are still some things that this best-selling multi-use cooker can’t do. One of them is connect to your iPhone or Android smartphone, and that’s actually a pretty big did in an age where everything and everything is “smart” and connected. 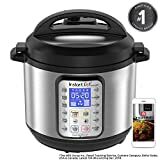 If you want to step up your Instant Pot game with smartphone connectivity, today is definitely the day to do it because Amazon is running a rare sale that slashes $30 off the price of the Instant Pot Smart WiFi 6 Quart Multi-use Electric Pressure Cooker. Definitely grab one before this deal is done, or you can grab a refurbished model and save even more.